At Duffy we pride ourselves on providing the best possible education for all our students. Our staff are dedicated to ensuring that whilst providing a quality learning program there is a focus on the individual needs and strengths of all children. Our commitment to providing quality programs ensures that we provide all children with the skills to become productive and valuable citizens of the future. Working in partnership, we ensure that we gain a balance between conserving and renewing what is, and anticipating and building what can be, to build a school culture that develops values and social capacity in all students. All enrolments for ACT Government Schools are now online. All ACT children are guaranteed a place in an ACT Public School, from kindergarten through to college. 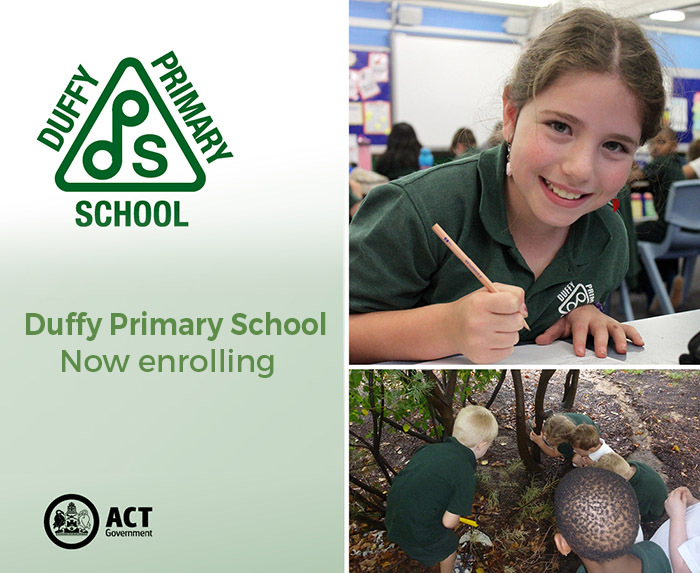 Information about the enrolment assessment criteria and priority enrolment areas can be found at https://www.education.act.gov.au/school_education/enrolling_in_an_act_public_school.